With cost being the "driving factor" when reviewing its options, the airport decided to use cold in-place pavement recycling to resurface the 3,300-foot runway. Although the method is not often used for airports, project designer RS&H considered it the perfect solution for SSI. 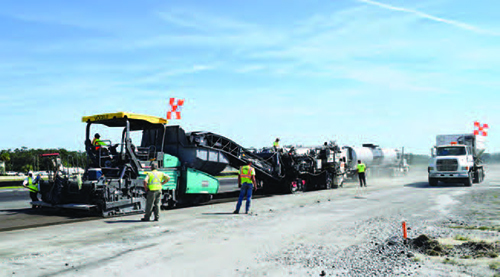 Recycling existing pavement materials onsite made the project affordable and environmentally friendly-welcome attributes for the surrounding community, explains Brian Thompson, a senior aviation engineer with the consulting firm. In total, the project cost $1.39 million, with the Georgia Dept. of Transportation (GDOT) funding 75% and the airport paying for 25%. Runway Rehab: Seaboard Construction Co.
New Cabling: 50,000 linear ft. Lighting & Precision Approach Path Indicator: Airport Lighting Co.
For airport officials, keeping SSI's secondary runway operational was more than just important; it was necessary. "Wind conditions are more critical for smaller aircraft, and being on the ocean coast, there is a higher degree of various wind conditions," explains Robert Burr, executive director of the Glynn County Airport Commission. "It is important to have at least two runways, affording four possible landing directions." Fortunately, state transportation officials recognize the importance of the small, towerless facility. "With more than 90 based aircraft, SSI is one of Georgia's busiest general aviation airports and is a vital asset within Georgia's statewide aviation system," says Steve Brian, GDOT's aviation program manager. "The airport supports a variety of flight operations, including government, charter, business and general aviation, and provides a seamless connection to regional, national and global economies. Maintaining the secondary runway pavement at this airport was vital to maximize operational flexibility in a coastal environment." Last year, SSI logged about 43,000 flight operations, largely for tourists drawn to the area's tony beaches, golf resorts and nature activities. Back in 2004, powerful world leaders converged on St. Simons Island for the G8 Summit. Due to wide, full-depth cracking in the pavement, RS&H engineers knew that SSI's secondary runway needed more than just an asphalt overlay; but complete reconstruction was unaffordable and soil conditions were unsuitable for cement stabilization. "We searched for more ideas at the request of the airport director and came across cold in-place recycling," Thompson relates. "Vendors who did this sort of work came out to look at the site and thought the runway was a good candidate." Burr and other airport officials were pleased with the option. "Cold in-place recycling saves the contractor costs of removing milled material and trucking it off the island and bringing new material in," he explains. "It also cuts down on community impact by reducing the number of trucks. The [low] impact of construction activity on the tourist destination of the island had a very favorable effect on our decision to use this process." The process also eliminates the need for hot asphalt. "It's very similar to conventional asphalt, but there's no heating; so you're not using oil or materials to heat it," Thompson remarks. "That means you don't have the off-gassing that comes with it, or the smell." GDOT was also comfortable with the recycling method. In fact, the department had previously approved and funded the technique at four other general aviation airports in Georgia. "Although it is not our traditional method of pavement rehabilitation, it has proven to be one of the best tools in our toolbox to rehabilitate pavements with severe longitudinal and transverse cracking and prevent future reflective cracking," says Brian. To execute in-place recycling at SSI, pavement was milled 5 inches deep and ejected into a trailing hopper, where it was mixed it with a small amount of Portland cement and an unheated asphalt emulsion. That mixture was then fed into a paving machine, which rolled it into place to create a base course for the pavement. Machinery was connected as a single equipment train, notes Thompson. Thompson considers cold in-place recycling a "win-win" for SSI, because it was environmentally friendly and reduced costs. "The community was concerned about the environment, and we didn't have any problems with [opposition to the project]," he reports. "It was all good public relations." The downside of cold emulsion is that crews add water to the asphalt, and it takes four or five days after paving for the water to evaporate and the material to set, Thompson explains. The process also produces a base that is "fairly coarse," with visible chunks. At SSI, contractors installed 2 inches of conventional asphalt on top of the recycled base course to smooth out the surface. "Instead of doing 5 inches of asphalt, we only had to do 2," reports Thompson. "That was a huge difference." Advantages aside, cold in-place recycling is not appropriate for airports with traffic from heavy aircraft. The weight limit for the resulting pavement is about 16,000 pounds, advises Thompson. The project team encountered an additional challenge at SSI when engineers found areas with sand asphalt base layers-a material used several decades ago to save money. "The problem was that when we exposed the layers, they became brittle and turned back into sand," Thompson explains. To correct the issue, crews removed the material and replaced it with standard aggregate before proceeding with the surface layer as planned. 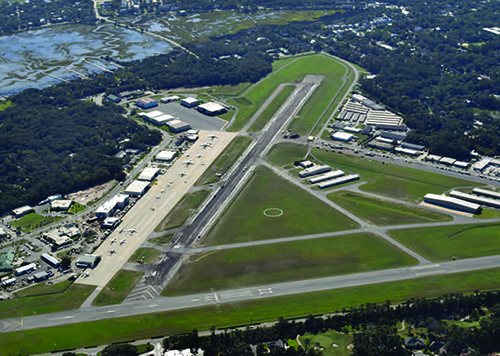 Although the resurfacing project was originally intended to be a stand-alone endeavor, new lighting and signage was also in the improvement pipeline for SSI's secondary runway. Originally, airport officials thought these would be separate projects; but as planning for the resurfacing effort began, it started making sense to bundle them. "We delayed the cold in-place pavement recycling project to line up with the other two projects," Thompson recalls. "We didn't want to close the runway one year and then again the next year. Eventually, the projects got close enough where they would only be six months apart; so we pushed back the [resurfacing] project to make them all align." SSI closed its secondary runway from September 2016 to January 2017 for improvements, but its 5,500-foot primary runway remained open for traffic. Taxiways were adjusted to accommodate the temporary changes. During the airfield lighting portion of the project, contractors installed more than 50,000 linear feet (about 9.5 miles) of cabling. Other elements included 44 new runway lights, 112 taxiway lights, 28 lighted signs, a new precision approach path indicator (PAPI) lighting system and a supplemental wind cone. "All the signage is now upgraded to current standards," Burr reports. "It's a vast improvement over what we had before. Prior to this, taxiways and turn-offs were not identified. Now, we have good directional signage for pilots." Total cost for all three projects was $2.47 million. FAA paid about $442,000 for eligible taxiway improvements, lights and signage; GDOT contributed $1.51 million; and the Glynn County Airport Commission paid nearly $525,000. In retrospect, Burr says he is pleased with the project because it allowed the airport to continue to operate two runways at an affordable cost. "Typical funding sources were not available for this project. This was the perfect opportunity to have cost savings and operational savings with the runway only being closed for four months," he reflects. "We were able to put back in service an excellent runway, and pilots are now very complimentary of the runway we have in place."